Veterans at the state capitol. 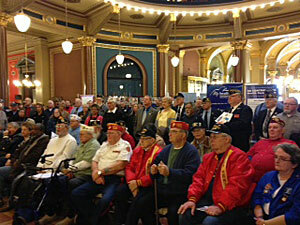 Hundreds of veterans have gathered at the statehouse today to lobby legislators on veterans issues. Their top agenda item: passage of legislation that would end state income tax charges on military pensions. Rick Skuya of Sioux City was in the “Army Air Cavalry” in Vietnam as a helicopter mechanic. He’s a “life-long” Iowan who hopes this tax change might lure his son back home. “Do it quick because we’ve got a son in the Navy and he’s out in Washington — out to sea right now — and I hope he comes back to Iowa,” Skuya said. John Regan, an Army veteran from Waukon who served in Vietnam, is lobbying legislators on the tax topic, too. “I think it’s the right way to go,” Reagan says. Virgil Carstensen of Waukon, a Vietnam vet who served 20 years in the Navy, says making military pensions state-income-tax-free would “definitely” be a good step for legislators to take, on top of already boosted tuition grants and home buying assistance for Iowa National Guard soldiers. “We were coming down here 10 years ago when our portfolio in the state was probably the lowest of the 50 states and now, through the efforts of the last few years and the working and understanding of everybody, it’s improved tremendously,” Carstensen says. A bill that would end the state income tax charge on military pensions seems on the fast track in the Iowa Senate. Charles Ira of Spillville, a World War II veteran who will turn 88 next month, applauds that speed. “I hope that happens,” Ira says. Also today, Congressman Bruce Braley announced he has the support of over a thousand military veterans and their families for his U.S. Senate campaign. 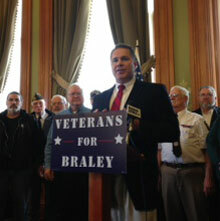 Braley, a Democrat from Waterloo, held a news conference at the statehouse surrounded his veteran supporters. Todd Epperle of Marshalltown — an Iowa National Guard soldier who is a Republican — is a co-chair of the group. Epperle mentioned Braley’s help in securing back pay for the Iowa National Guard soldiers who served nearly two years in Iraq — a longer deployment than any other unit in the military. Braley’s father was a Marine during World War II and Braley carried a jar of sand from Iwo Jima with him to today’s news conference.